Our product range includes a wide range of natural ball. These Teak Sandstone Spheres are sculptured from solid "Teak"sandstone, selected for its beautiful swirls of colour. 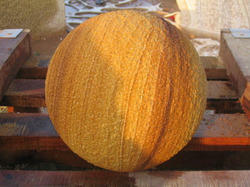 The simple sphere is still popular as a garden ornament, and for adorning gateposts. Looking for Stone Ball ?